MVP Pizza offers multiple signature pizzas, including BBQ Chicken (left) and Gyro & Tzatziki (right). Your new favorite pizza joint is here, and its name is MVP Pizza. Pizza is a staple of every college student’s diet. The combination of comfort, ease and price make it the clear choice for everything from late night studies to movie nights in. Fargo is full of pizzerias; from the gourmet Blackbird Woodfire to the nationwide chain Pizza Hut. Even an all-time favorite can get old after a while. Luckily, a new North Fargo pizzeria is ready to serve campus and the area. Many were sad to see their favorite Happy Joe’s close their North Fargo location after 25 years. The small chain, known for their taco pizzas, closed the location in May 2017. Last year, it became evident that work was quietly going on in the small corner shop. Then, a month ago, the new sign suggesting “Make the kids happy, bring home a pizza” and banners appeared, declaring the new business as MVP Pizza. The modest carryout and delivery pizzeria opened quietly Jan. 21. The family-owned business offers build your own pizzas with a variety of toppings and multiple specialty pizzas. As soon as I decided to try MVP pizza I realized it was full of surprises. The first is the deals. As a college student, you get a 10 percent discount with your school ID. Not only that, but with every pizza you get a free 2-liter Pepsi product. That’s right: free with every pizza. 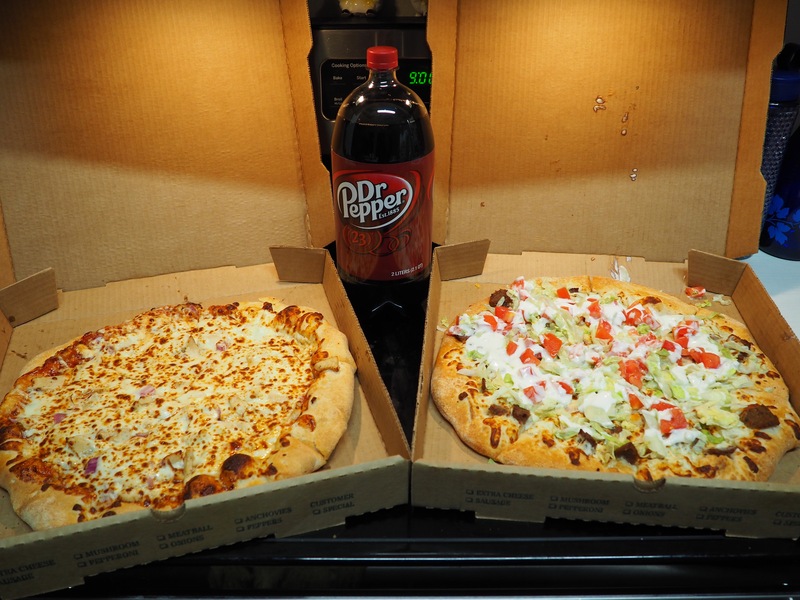 I was able to get two large signature pizzas and two free Dr. Peppers for $30. Probably the most important surprise was the quality. When it only took 10 minutes from the time I walked in and ordered to it being done, I wasn’t sure what to think. One look at the pizza put my mind at ease. You could see that everything was made from scratch without cutting corners. The cheese was beautifully melted on the BBQ Chicken Pizza, and the lettuce and tomato was fresh on the Gyro & Tzatziki pizza. From the first bite I was hooked. There is a perfect amount of sauce, not too much so everything slides around and burns your mouth, but not skimpy either. The crust is reminiscent of a much more expensive pizzeria like Blackbird Woodfire and somehow also had that slightly charred flavor. It was airy, not too chewy and still had a satisfying crisp to it. The Gyro & Tzatziki pizza had real gyro meat and a thin layer of cheese with an ample amount of iceberg lettuce, chopped tomatoes and homemade tzatziki sauce. It was good warm, but personally I enjoyed it even more, cold the next day. It really tasted like a gyro. There is no doubt in my mind that I will soon return for more great quality pizza at a reasonable price. I encourage you to do the same.